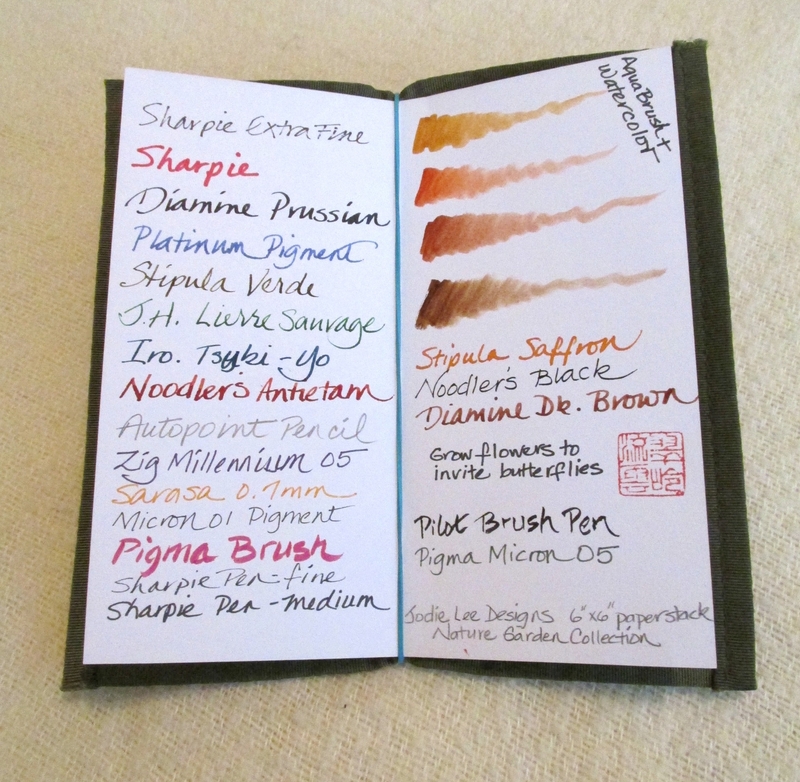 Sunday Reads: Pens, Inks and Paper. Oh, my! Want to expand your collection? There are eight reviews in this lot to help you choose what’s next. That’s a first. I’ve never used “oodles” in a post, but for this bunch, it seemed just right. 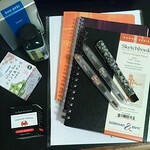 Quo Vadis Blog: Writing Wednesday: Why journal? 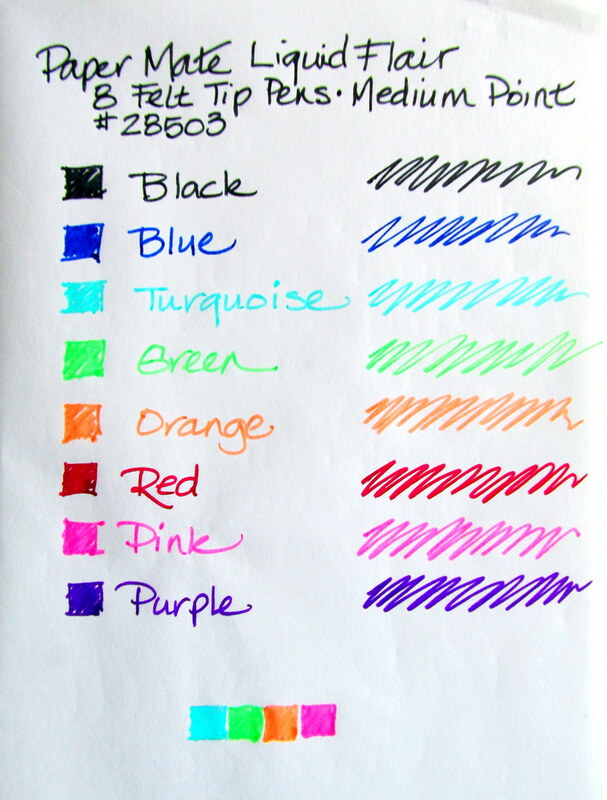 Recently, Ed Jelley wrote about Paper Mate Liquid Flair Felt Tip Pens and that was enough to persuade me to purchase a set of eight colors. 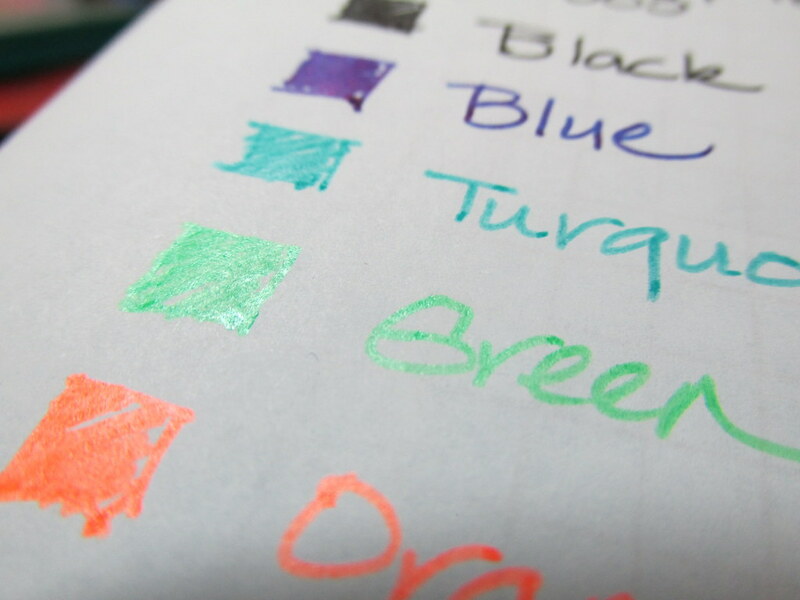 They won’t replace fountain pens, but they are a handy way to put ink on paper. The pens are plastic and lightweight, but with enough girth to feel comfortable in my hand. The top snaps on rather loudly and firmly and can be posted without overbalancing the pen. The nib produces clean lines and glides easily with just a hint of feedback. 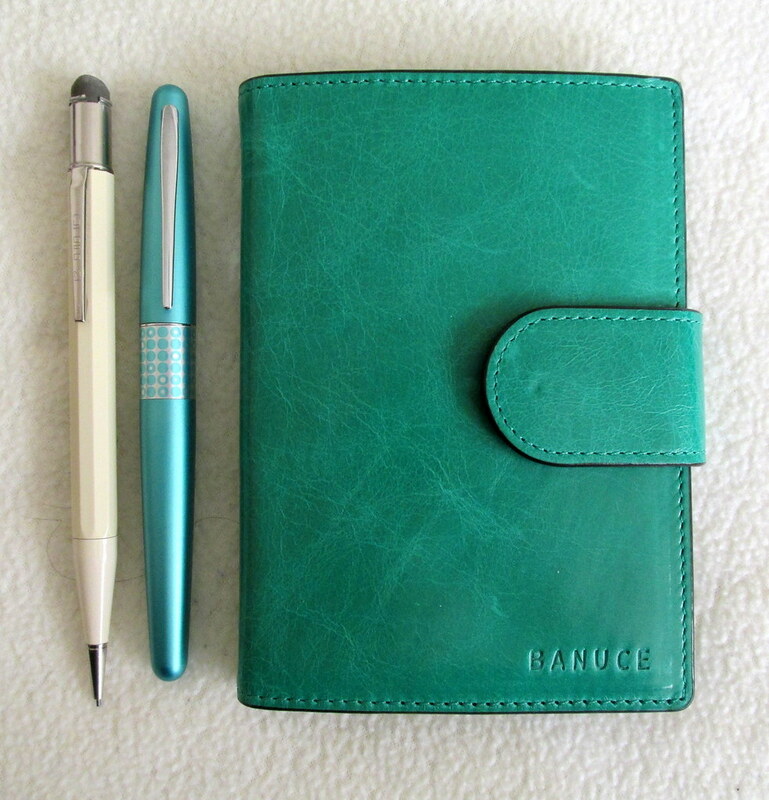 In fact it quite nearly skated over the Midori #013 Tomoe River paper. Adjusting the speed at which I wrote improved control. 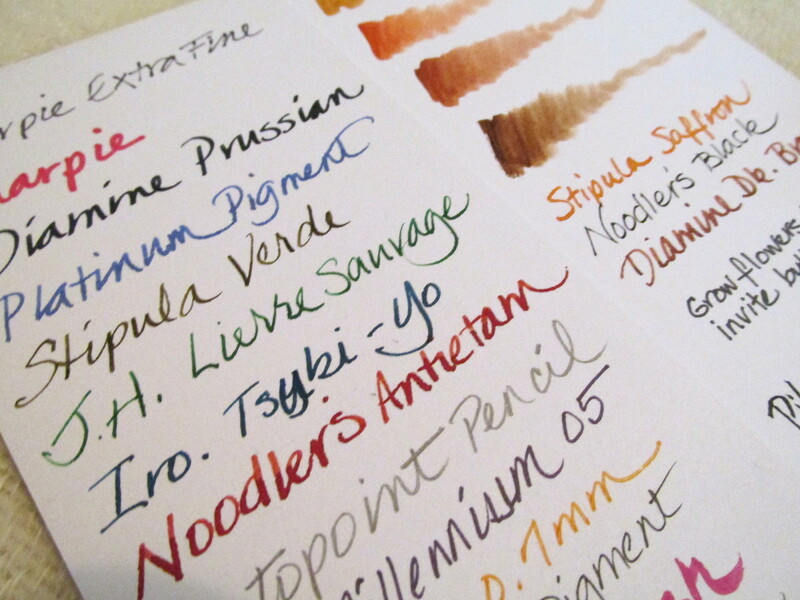 The smooth, juicy flow produces strong coverage, but dries a little slowly with the medium nib on Tomoe. A more absorbent paper speeds the drying time to a second or two. The reusable pouch states that the colors are vivid and with that I would agree. 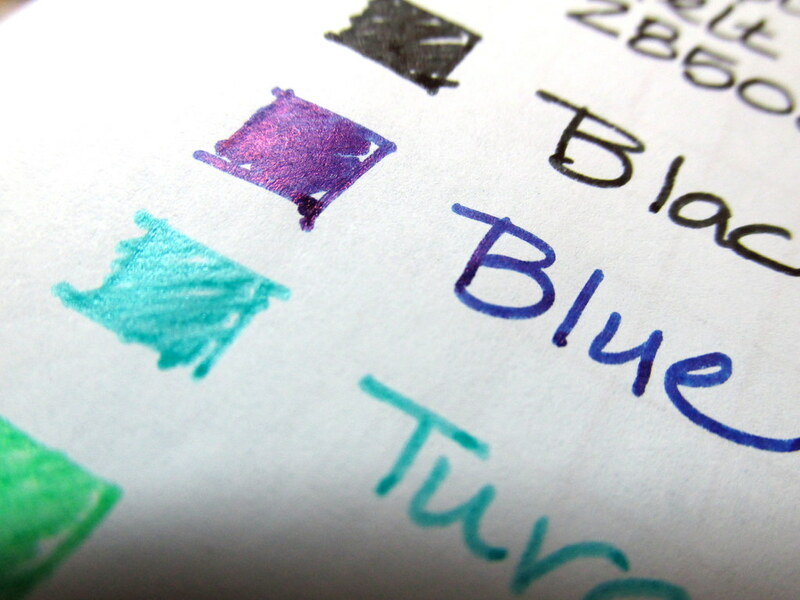 The blue has a lot of red in it and dries with a sheen you might expect of fountain pen ink. It wasn’t evident except where ink puddled, but still impressive when it did happen. Turquoise, green, orange and pink are reflective catching the light at some angles. However, those colors aren’t as strong as the other four. Black, purple and deep red are very saturated and matte in comparison. The black will likely find a regular home in the pen box on my desk. The dark red is a rich color and good contrast for the black, so it is headed for the box as well. Turquoise is usually an easy sell for me, but this one is a bit more pale than my preference. However, for the convenience of a felt tip, it will have its opportunities. None of my fountain pens felt displaced or jealous. Big yawns mostly. 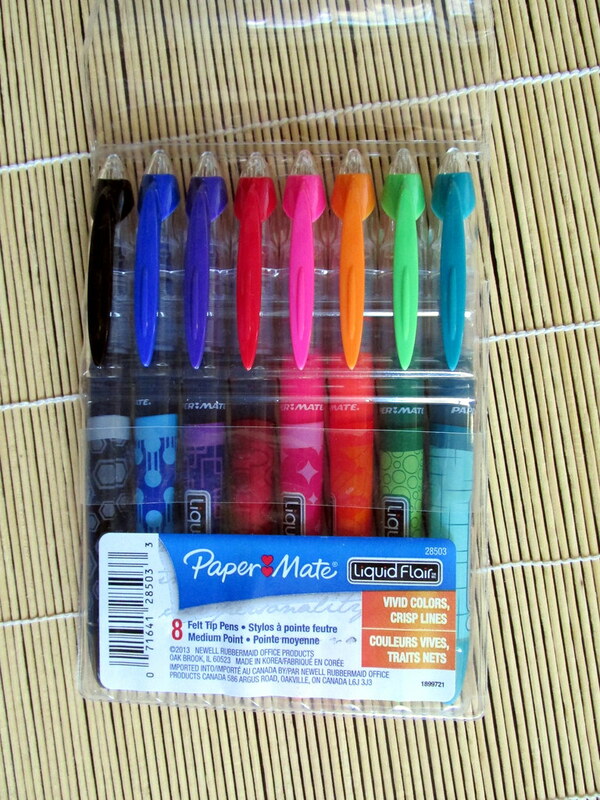 However, Paper Mate has done a creditable job of bringing a useful felt tip to market with the Liquid Flair. Besides the attractive colors and comfortable form, these pens should weather the summer heat without fuss. Don’t tell my fountain pens, but that will keep the Flair pens on my desk for months to come. Instant starts and no dried out nibs sound very appealing after last week’s hundred degree days. 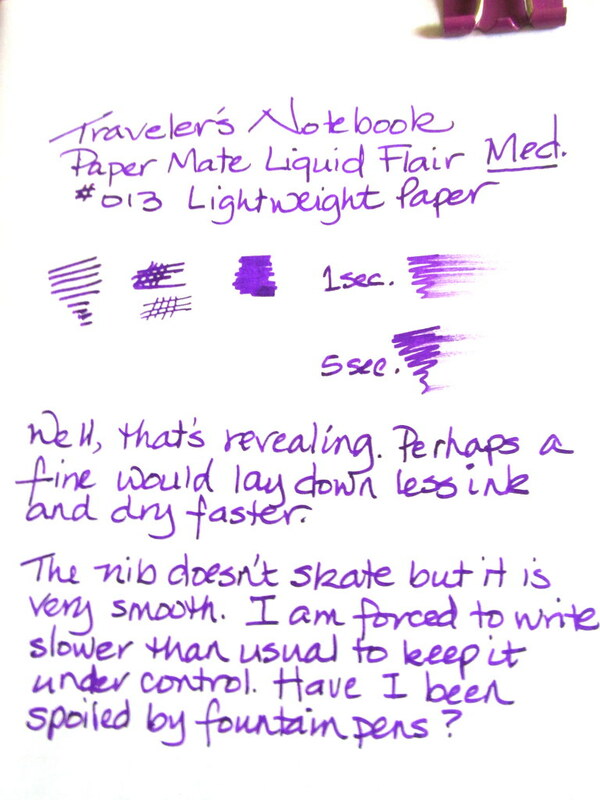 My kit of Liquid Flair pens came from Amazon along with the Traveler’s Notebook #013 used for testing. But here’s an idea worth considering. These pens would write very well in those notebooks that can’t handle fountain pen ink. Finally, that stack of Moleskines might get put to use. My FPs certainly won’t mind since they know inferior paper is beneath them. Who can argue with such clever little devils? Re-purposing binders and notebooks was covered recently, but a new idea has emerged in the last couple of days that deserves mentioning. For some reason, pretty paper sneaks its way into my shopping cart whenever I hit one of the crafts stores or stationery shops. Recently, this very attractive pad of scrapbook paper managed to follow me home. I had no use for it at the time, but realized this morning that folding the sheets in half would make them fit perfectly into a checkbook cover. 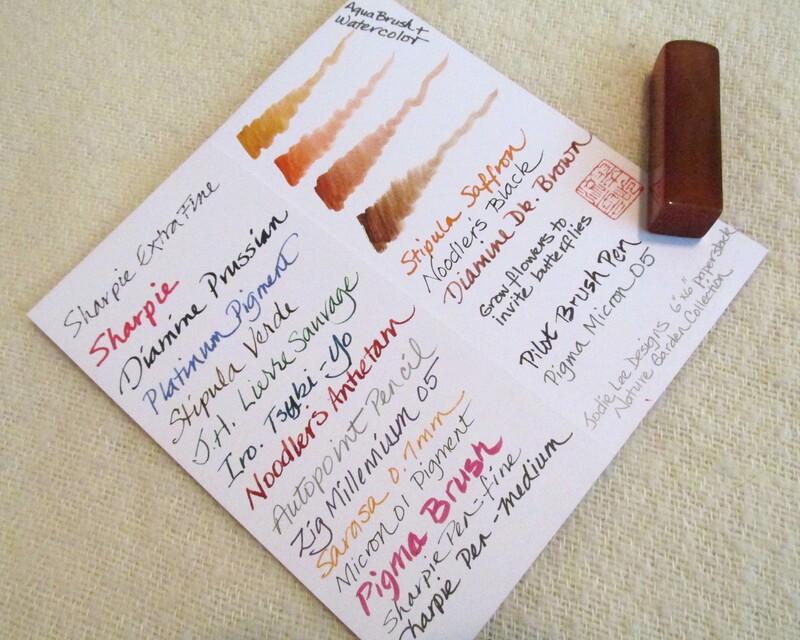 But would fountain pen ink work on the coated stock? Remarkably well to my surprise. 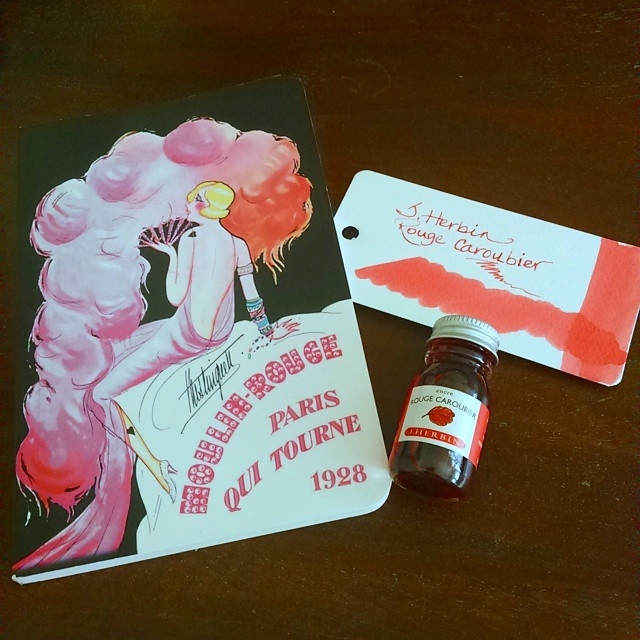 The paper is textured which allowed some of the ink to appear to feather, but a smoother scrapbook paper might not. I wasn’t offended by it regardless. Even a Sharpie worked beautifully and there was no bleed-through whatsoever. So you can write on both sides of the paper and even over the printed designs. Does that not open all sorts of possibilities? This is how I put it together. 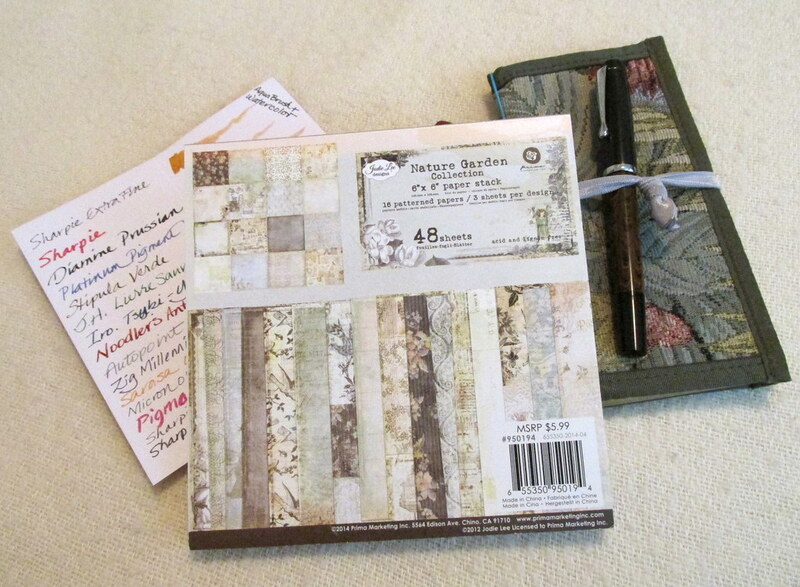 The package of Jodie Lee Designs Nature Garden Collection 6″ x 6″ Paper Stack contains 48 sheets and retails for $5.99. Sales and discounts can reduce that to much less. Since both sides are usable and they get folded to create four pages each, that’s 96 blank pages and 96 decorated pages on which to write. 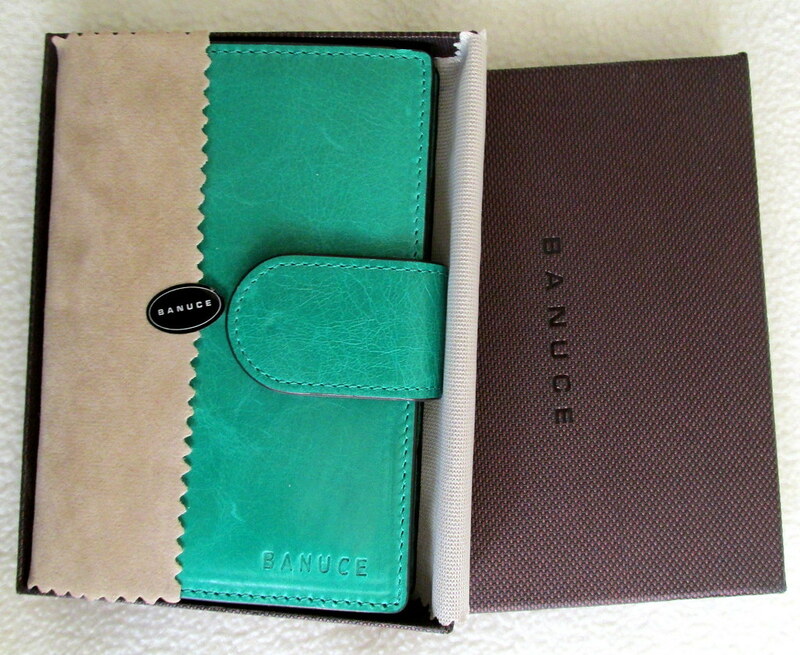 All it takes is a checkbook cover to protect it and a rubber band or 1-2mm elastic string to hold the pages in place. Make sure there is a little tension when the band is placed in the crease. If not, the paper will fall out too easily. A second band around the outside will hold it together and even secure a slender pen or pencil just inside the edge of the cover. Another way this can be assembled is with vellum between the pages for a very fountain pen friendly paper and more room to write. The decorated pages will show through as a soft background to your musings. Torn edges might be especially nice and vellum does that very well. 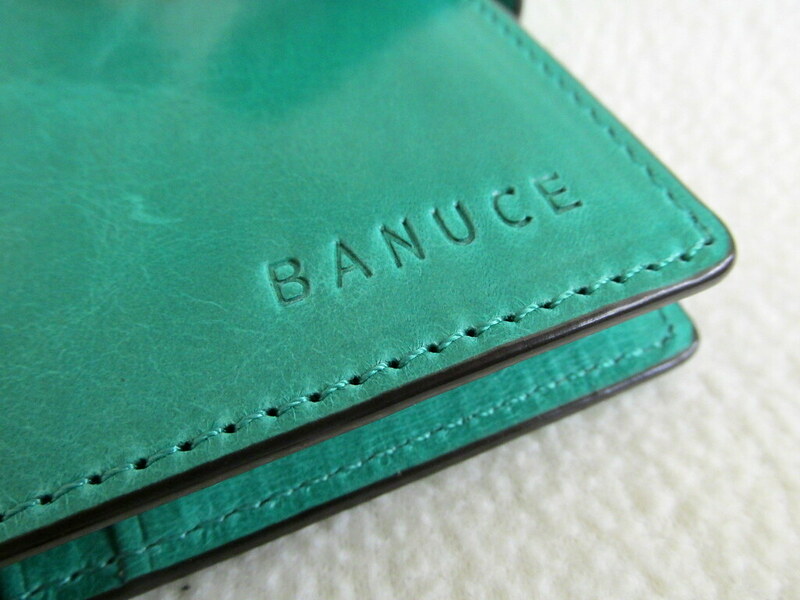 Has your checkbook cover seen better days? 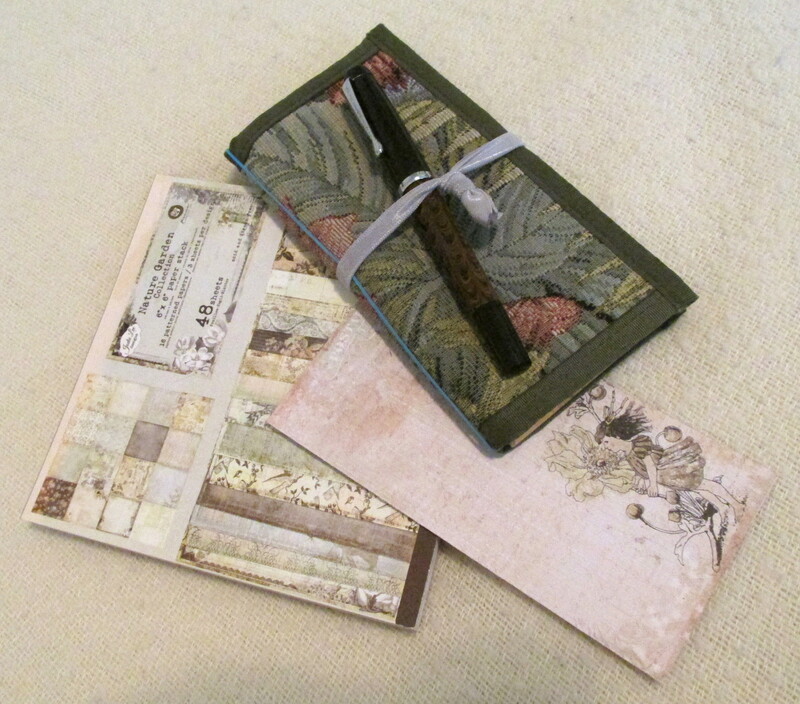 Use washi tape to strengthen edges and cover worn areas. it’s all part of personalizing your notebook. 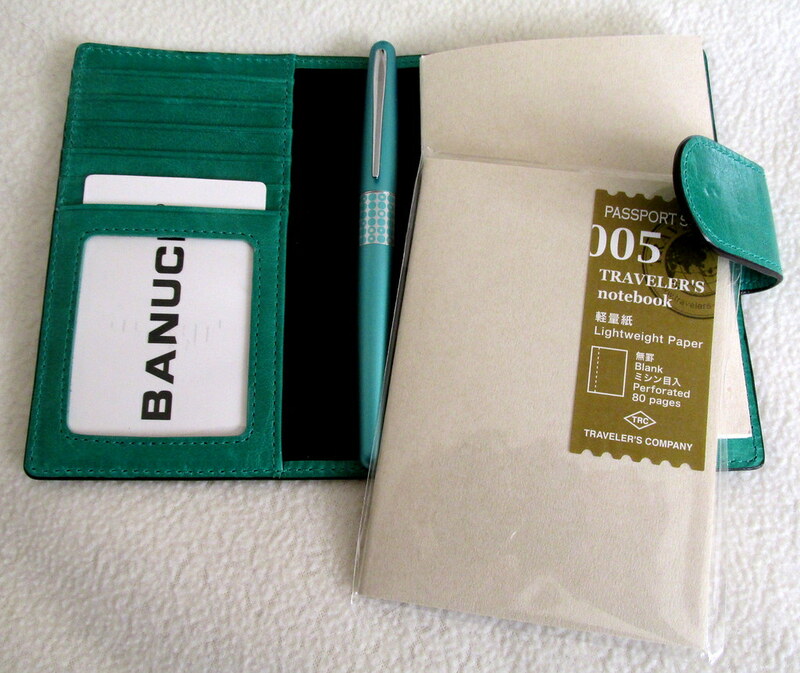 If you like the scrapbook paper idea, but are a Midori fan, the 12″ x 12″ pages can be cut to fit the Traveler’s version. The elastic band will hold the pages together without having to bind them together. 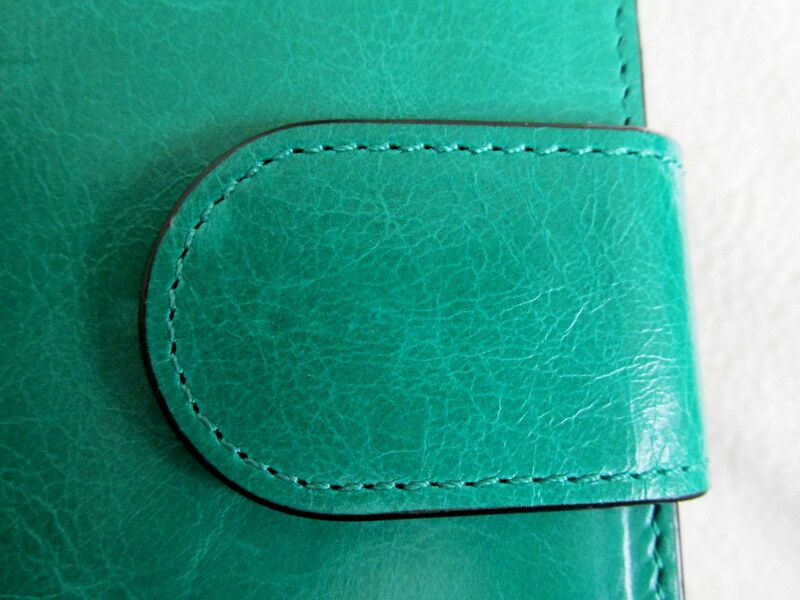 Simply adding a few pages here and there inside a Midori would add a little color and interest. For less than $5, I put together a new journal with some very pretty paper that works with wide nibs and fountain pen ink. I’d say today was a day well spent.